As a blogger, and someone who works in social media, I pay pretty close attention to trends in blogging. One great trend I’ve been happy to see is when food bloggers get cookbook deals. It happened to my friend Liz, and it’s happened to a bunch of my favourite blogs over the past couple of years. The most recent one? Thug Kitchen. Now, if you’re not familiar with Thug Kitchen, you really need to head over there right this second and have a look at it. I just have to warn you–the site may be NSFW (depending on where you work). Thug Kitchen’s brand is built on a couple of things: gorgeous #foodporn photography, and a lot of f-bombs. The Thug Kitchen Cookbook stays true to brand. Lots of gorgeous photos, lots of swearing. The sections include breakfast, salads, snacks and sandwiches, comfort food (soups and stews), mains, and desserts. Two things you need to know about Thug Kitchen: they are vegan and, until recently, the identities of the authors were hidden. In fact, you won’t find the authour’s names anywhere in the book. Even in the acknowledgments, they simply use initials. I’m guessing the reason behind this is because they are a couple of young, middle-class white folks, but I’m not really interested in exploring that angle. I love Thug Kitchen because, yes, swearing is funny, but mostly I love them because they make good food that happens to be vegan. This book is really aimed at the beginner cook–someone who is in their early 20’s, and just going out on their own. When I was in my early 20’s and went away to university and lived on my own for the first time, I ate A LOT of hot dogs, Kraft dinner, chicken nuggets, and french fries. I know that might shock you, given how you know me today, but I’m not one of those people that grew up in a gourmet household, I only really learned how to cook in the last 20 years or so. So, simply put, I think this book is awesome, and should be given to any kid who is leaving home for the first time. I’m not saying that they need to be vegan, but learning to cook healthier right from the start is a good place to start. There are tons of basics and tutorials in here to help the beginning chef–even I learned a couple new tips from this book! I also really love that this cookbook isn’t touted as a Vegan cookbook. It’s vegan, yes, but it’s not sanctimonious and preachy in the way that some people can be. It’s good food. That happens to be vegan. Period. The end. Which brings us to our recipe. I love me some caesar salad. My son loves caesar salad. Ergo, we eat a lot of caesar salad–sometimes as much as 2-3 times a week. Now, if you’re vegetarian or vegan, you’ll need to leave out the anchovies that normally form the salty base of most caesar salad dressings. You could do a straight-up, simple vinaigrette. 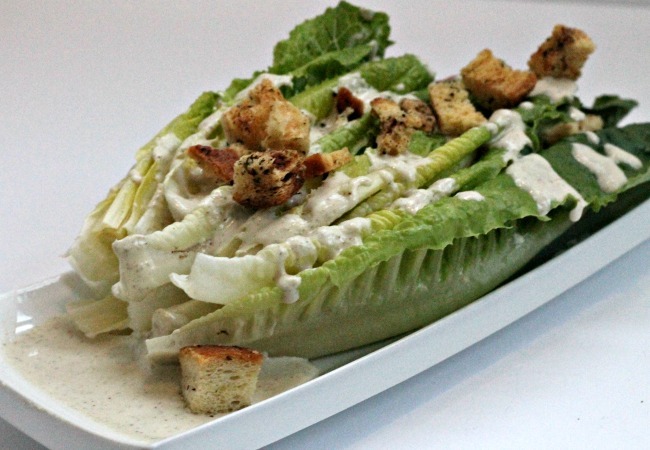 But this–this is a creamy vegan Caesar salad dressing. The creaminess comes from almonds–the technique is similar to how you’d make a cashew cheese. The best part of this dressing? It still has that unctuous, salty base, without the use of anchovies. 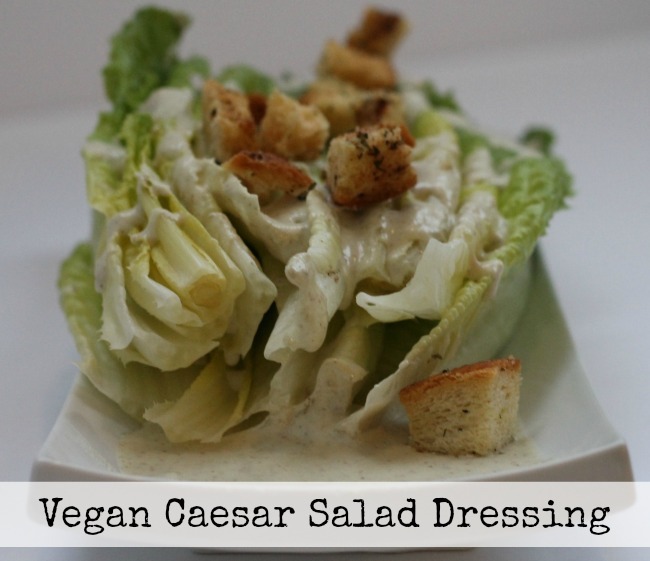 Capers are what make this vegan caesar salad dressing magic. By the way, I never buy croutons. What a huge waste of money! I buy a big loaf of french bread at my local grocery store, and take about a fourth of it and let it sit out overnight. The next day, I cut it into cubes, toss with some olive oil, salt and pepper, garlic powder, and whatever dried green stuff I have kicking around–basil, parsley, oregano. Lay your cubes out in a single layer on a cookie sheet and bake in a slow oven for about 20 minutes until they are toasty. I then store them in a mason jar in my cupboard, for instant caesar salads. Place the almonds and the hot water in a small bowl, and set them aside to soften, about 15 minutes. In the mean time, mince the garlic finely. Once the almonds are softened, throw them into a blender with the water they were soaked in. Add the garlic and the rest of the ingredients (except the capers), and blend well until nice and creamy. Taste and adjust seasonings. If the dressing seems too thick, add a little more water and blend again. Finally, add the capers and blend for 5 seconds. Store in the fridge until ready to eat. To make the salad: wash and spin dry your lettuce. Cut or tear into bite-sized pieces. Place in a big bowl, top with a couple tablespoons of dressing, and toss well. Top with croutons (and vegan bacon bits if you like) and serve.